Where Can I Sell Scrap Metal on Cape Cod? Thanks to popular television programs such as History Channel’s American Pickers and Spike TV’s Scrappers, the American public has become acutely aware that there is money to be made in the collecting and selling of scrap metal. Here on Cape Cod you can bring all of your scrap metal and get the best prices in Massachusetts at Mid City Scrap Iron & Salvage in Westport. Collectors come from all over the Cape to sell their scrap metal at Mid City, which accepts a wide array of ferrous and non-ferrous metals. What’s the difference? Ferrous metals contain iron alloys and are magnetic, and non-ferrous materials are non-metallic, such as aluminum, lead, stainless steel and copper. Tip – Always have a magnet on hand. This is the best tool for pickers or scrappers when collecting scrap metals – it will save you a lot of time. Another thing you need to know is that there are different grades or types metals that must be separated before they are sold. The scale operators at Mid City will help you separate these items, but if you know you have different grades and can separate them accordingly, it will reduce the amount of time you spend sorting your metals when you could be weighing, unloading and getting paid. Tip – Keep your ferrous and non-ferrous items separated for faster processing when you come to Mid City Scrap Iron & Salvage to sell your scrap metals. Because ferrous scrap is generally identified as metals that contain iron alloys, a lot of people misinterpret this to mean that steel is the only ferrous metal, which is a big mistake. Three elements will actually pull a magnet: iron, cobalt and nickel. There are other rare earth metals that will pull a magnet but they are really rare and you aren’t likely to come in contact with them anytime soon. Iron is very common so is the least valuable of the ferrous metals. Nickel is next in value and is actually even more valuable than copper. The most expensive ferrous metal by far is cobalt. In most cases the ferrous metals you find will just be iron, but there is a chance that you just discovered some nickel or cobalt as well. Tip – Some items that contain iron and nickel, such as #304 stainless steel, aren’t magnetic. Other items will have a magnetic compound, such as ceramic, but obviously can’t be sold as ferrous metal. Lots of different types of people sell scrap metal. They come to Mid City Scrap Iron & Salvage from all over the Cape Cod area – Province Town, New Bedford, Falmouth, Buzzards Bay, Middleboro and everywhere in between. Business owners, homeowners, professional scrappers and just-beginners. There are plenty of opportunities for people from all walks of life and varying degrees of experience in selling scrap metal to make money from this lucrative opportunity. 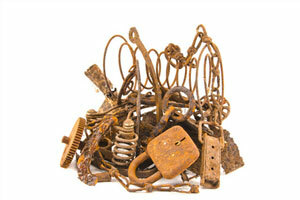 Believe it or not, you have probably thrown away tons of valuable scrap metal throughout your lifetime. Brass or steel hardware is often found on old doors and cupboards, making it worth the time and effort to remove these items and sell them when doing a remodeling job on an old home. Even if you only find bits at a time, most of these items can be saved up until you have a full car or truckload to sell. Tip – Valuable scrap can be found in old car parts, discarded appliances – even broken Christmas lights. It is important to find out about local laws or ordinances that might prevent you from “picking” scrap metal from neighborhood trash cans or other disposal areas. Some cities have started imposing fines and penalties on scrappers, so it is important to know the rules before you inadvertently break the law. The more you learn about scrap metal, where it can be found, how it needs to be categorized and sold – and how much money you can make – the more likely you will be to want to get involved in scrapping as a side business or hobby. Call Mid City locally at 508-675-7831 or call toll free at 1-800-334-4789 for more information about rates, hours or directions to the Westport location.